step for a man and a giant leap for all mankind. 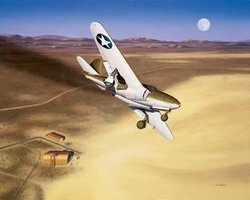 Image Size: 24" x 20.25"
Paper Size: 28.5" x 24.75"
Although not as sleek as the planes that would soon follow, the Bell XP-59 entered the history books as America's first jet aircraft. Although outclassed in performance by the top propeller driven fighters of the day, the XP-59A was an invaluable tool for the USAAF transition to jet power. Personally autographed by Lt. Gen. Laurence "Bill" Craigie, America's first military jet pilot.